Six inches of snow in a rear wheel drive car? No problem! Just inside the Arctic Circle a thick blanket of snow and ice covers a placid woodland, and a solitary blackbird is singing in the fir trees. All of a sudden the stillness is punctured by the roar of a 4-cylinder boxer engine, and a Toyota GT86 sliding sideways out of the forest. 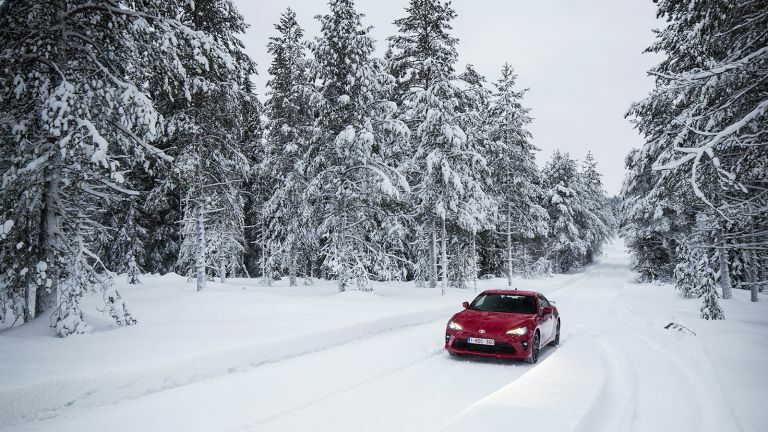 T3 recently flew to Rovaniemi (Santa’s home town) because someone at Toyota had the amazing idea of launching the company’s updated rear-wheel drive sports car in the ice covered landscape. Sure, it’s not ideal for testing the nuances in handling and power delivery, but it’s some of the most fun we’ve ever had in a car. Let’s take a look at what’s new in the 2017 Toyota GT86. At first glance the updated GT86 looks largely unchanged, and that’s because it is. Toyota has taken the approach of, ‘if it ain’t broke, don’t fix it’. But, it's not standing still, the company has focused on three areas of improvement; aerodynamics, handling dynamics, and interior quality. In design terms, the updated car has matured slightly, with lower, wider styling features which give it a more sporty stance. We really like it. Everything that’s been changed, even the smallest detail, has improved the aerodynamic performance - not simply for superficial reasons. The most notable new addition is the rear wing, which has a positive impact on both aerodynamic performance and stability. Does that mean it’s more difficult to get sideways? It certainly wasn’t difficult on a frozen lake, but we’ll have to wait until we’ve driven on tarmac for a final verdict. One thing that hasn’t changed is the powertrain, you get the same naturally aspirated 2.0-litre boxer engine driving the rear wheels. Toyota has made a few tweaks, adding its D-4S direct fuel injection technology to slightly increase the throttle response, power and torque over a wider range of engine speeds. Dynamics have been improved by tuning the suspension for improved handling, stability, ride comfort and turning performance. There’s also a brand new Track mode, which features the minimum amount of Vehicle Stability Control, and only kicks in if absolutely necessary. Finally, the interior has been refined. It’s very driver focused; using an all black, matt interior to reduce distraction to the driver. We’d definitely recommend opting for the ‘Pro’ model, which comes with a leather binnacle hood, alcantara seats, and red trim throughout the cabin. There’s a new smaller steering wheel, which really does feel and look great, and an updated infotainment screen, which we’ll talk about later. Can we tell you what the Toyota GT86 is like to drive? Not exactly, as previously mentioned, everywhere we drove was covered in a sheet of ice and snow (something which strikes fear into the heart of any English driver). Instead, we’ll tell you exactly what we got up to over 24 hours in the GT86. I woke up feeling refreshed, perhaps it was fresh air, or perhaps it was the fact I’d spent the night in a hotel made from ice, and my room didn’t rise above -3 degrees celsius. I'd definitely recommend it if you're planning a road trip. We set off at 8.30AM from the hotel, it was still pitch black outside, as Rovaniemi only gets around four hours of sunlight this time of year. The first kilometres were some of the scariest of my life; driving an unfamiliar, rear-wheel drive sports car on roads covered in enough snow and ice to bring the UK to a standstill for weeks. After a while I began to relax, and relied on the traction control systems and studded tyres to keep me safe. It certainly helps that the roads around Rovaniemi are barren compared to the UK, even at rush hour. After a hour of driving we arrived at the ice driving centre, where we’d be taught 'proper' car control in a safe environment. After being shown the courses by an extremely relaxed French guy named JC, we were left to our own devices, taking the GT86 around tricky technical routes and through the forest trail. We were able to experience the car in all modes. We found Track mode the most fun, it’s activated with a switch on the centre console, turning the VSC and Traction Control (TRC) to minimum levels, offering a great balance between slidey-fun and control. The system was developed using data gathered from the car’s participation Nürburgring 24 Hours, and Chief Engineer Tada thinks it can help drivers fully exploit their skills and unlock the car’s full potential. When we turned all systems off, it quickly became apparent how useful they actually were. After a full day at the ice driving centre we headed back the a hotel (not made from ice) for a proper nights sleep. We felt much more confident in driving on the icy roads this time, almost like a local. Thankfully, Toyota’s updates have extended to the tech inside the vehicle. Behind the wheel is a new digital instrument panel, featuring a 4.2-inch colour display, providing real-time driving data such as fuel economy, coolant temperatures, or more performance oriented data, such as a G-force monitor, power and torque curves, a stopwatch and lap times. Centre stage there’s a new 6.1-inch touchscreen running Toyota’s latest Touch 2 operating system. This provides access to media controls and sat nav, as well as connected apps such as Google Search and Twitter. It’s not the prettiest or slickest system available, and it’s quite slow, but it’s clear, intuitive and easy to use. Obviously tech isn't the focus here, Toyota has focused on driving enjoyment. Perhaps it’s too early to give the Toyota GT86 a final verdict, but we really enjoyed our time with the car. We’re glad Toyota didn’t change things up too much. Just like the original, the MY17 GT86 is great fun and excellent value in an attractive package. The sporty styling, fresh interior and updated multimedia system make it even easier to love.